In recent weeks, we were once again faced with drug-addled, psychotic mutants going around killing innocent people. And once again, we see the usual suspects screeching about the dangers of guns, and ignoring the real issue. 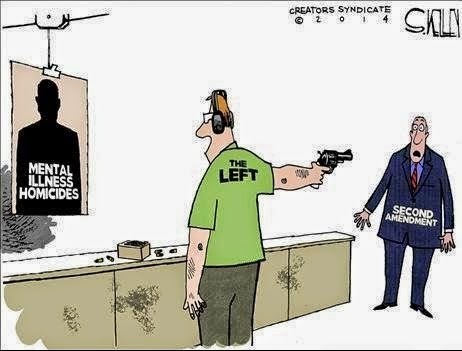 But then again, it's not really that surprising that the left fears a focus on mental illness. It is my belief that we're seeing the result of a decade of the progressive ideal of "everybody's a winner" and a move away from personal responsibility. No longer do we teach that there exists absolute truth in morals, and actions have consequences. It's no wonder we have a generation in despair. And it will be no wonder that these types of events, which have really always occurred even if somewhat less frequently, increase over the next couple of decades. Currently raising two little girls, we see the challenges of raising our daughters as good Christians and decent human beings in a society that increasingly focuses on placation rather than discipline and structure. Even among our daughter's Catholic friends. We try to make sure that our daughters know what it is like to lose sometimes, and to not get what they want. We know they definitely won't learn that from their friends or in school. Take the wacko at UC Santa Barbara. That guy obviously wasn't raised to have respect for women but was raised to expect instant gratification, and when he didn't get the immediate sexual gratification from the young women he obsessed over - he broke and went on a rampage. Now, obviously not everyone raised to expect instant gratification will become a mass killer like him - but it seems to me it greatly increases the chances for people who already have some mental instability. Well said Matt. Well said.